by Jarrod Jones. Mega-corporations are infiltrating our lives via technology—less science-fiction than a begrudging fact of life. 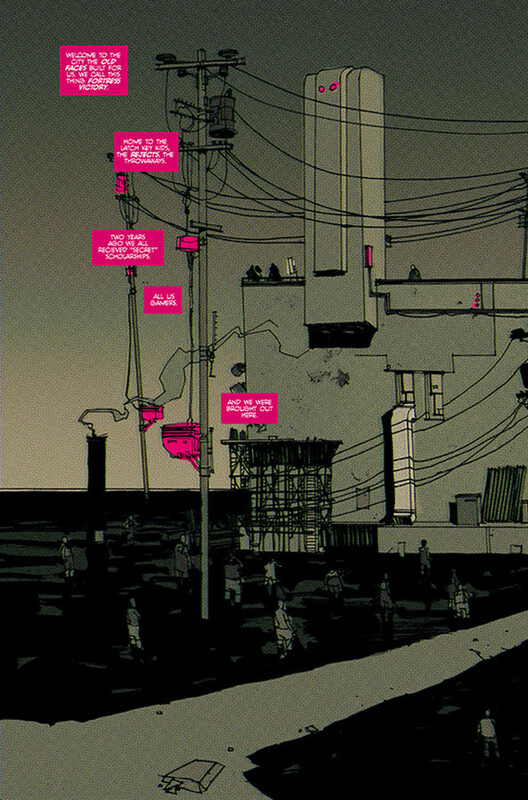 Image Comics’ latest taps into that gnawing anxiety and adds to it a rather demented twist: A Facebook-type company plots to overthrow the government and they’re going to use the kids who’ve grown up relying on their tech to do it. Conquest through an easy-to-use app. Insert all good “aggressive expansion” jokes here. Well ahead of its June 5 release, DoomRocket spoke with Sean Lewis about our culture and how it informs Thumbs, reuniting with comics wunderkind Hayden Sherman, and the importance of giving readers the most bang for their buck. 1. If you would, walk our readers through the premise of ‘Thumbs’. Sean Lewis: Adrian Camus is like Mark Zuckerburg in this world. He has created websites and applications that people depend on in their daily life. Kids worship him. He gives free tech with built-in war games to disadvantaged kids and numerous parents use his MOM™ app as a virtual babysitter. Thumbs is one of these kids. Nicknamed for his adeptness at the games, he and his sister Tabitha are raised by the MOM™ app and watch Camus’ live streams all the time. Thumbs even gets invited to a special school funded by Camus for the best and brightest at his war games. But a tension is growing. A section of the populace sees Camus and technology as inherently dangerous. And for his own part, Camus is turning these kids into an army. Thumbs is in the middle of it: trained by Camus but desperate to get back to his sister Tabitha, who is becoming a star student in the anti-tech movement. 2. Tell me about the book’s namesake, Charley “Thumbs” Fellows. Tech-obsessed, sure, and a victim of poverty, as well? How are you talking about class, and the exploitation of the underprivileged, in ‘Thumbs’? SL: He is an average teenager who wants to play video games. He’s poor. He lives in a trailer park. His parents both work long hours so he is left at home to watch his younger sister Tabitha with the help of the MOM™ app. A few months ago, Amazon was looking to create a headquarters in NYC. People fought it. Some on grounds that Amazon is evil. Or they kill mom and pop stores. And a bunch of other things. I sometimes think these are too broad-stroked. Amazon is a company that tries to make their consumers life of getting things easier. And yes, they destroy some things in that process. however, the most interesting thing to me was that they were giving free tech to lower income schools and free Amazon job training. On the basis, this is generous. But it’s unregulated. Amazon would control the advertising, messaging and information of these devices and these training programs. It’s a weird catch-22. They are the ones willing to give this tech to populations other people ignore. As the world gets more mechanized, it will be the people who get access to computers and tech advancements at the youngest age who will move ahead. What does that mean for people without the finances to keep up? If they take charity, it gives them some access, but we’ve also seen how Facebook and Google can literally direct people’s beliefs and policy. It’s a funny thing that societies do as the world starts to level itself and become more equal—we move the goal posts. We create a reliance on something new. The reliance almost always forces people to subjugate themselves. 3. In ‘Thumbs’ Charley is part of a private teenage army“raised” by the MOM™ app. Tell me about MOM™—what’s its function, and who benefits from its survival? SL: Honestly, I was at the mall and I saw at least three sets of parents hand iPhones over to toddlers to satiate them. I have a toddler. I get this solution. I’ve used this solution! But it made me think: How far are we away from an app that can literally just raise your kid? What if an app got made for a fraction of what day care costs (if you want to talk about class issues)? Now, that app would be networked. It would talk to the other technology. If it were raising your children, I assume it would be like a walking-talking Alexa. It could turn the stove off so the kids didn’t burn themselves, it could lock cabinets so they didn’t drink poison and so on. How powerful? A piece of tech, your children rely on and therefore grow to love that is networked with hundreds of others? What if you tried to turn them off? What if they wanted to fight back? The government is terrified of this at the top of the book and they turn all of them off. Except Thumbs’, who has gone AWOL in a certain way—no spoilers. 4. ‘Thumbs’ reunites you with your co-conspirator on ‘The Few’, artist Hayden Sherman. What about ‘Thumbs’ instigated this reunion? SL: Oh, as soon as The Few was over we agreed we wanted to do another book together. I threw a couple of ideas his way and this is the one he chose. He really liked the idea of a story with siblings at the center of it. Eric Stephenson at Image had been so supportive of The Few; he was equally enthusiastic about us following that book up. It’s been really fun to be at the point of getting it out there. 5. Sherman’s work seems tailor-made for a paranoid sci-fi like ‘Thumbs’. What can you tell us about the look of this story? How would you describe the aesthetic Sherman is bringing to ‘Thumbs’? How will it factor into the series’ themes? SL: I’ve been saying it in other interviews, but I think Hayden is the type of artist that in a few decades people will look back and see a real lasting effect and influence on the form. I knew the first time I saw some sketches of his on Facebook that no one was drawing books like him. 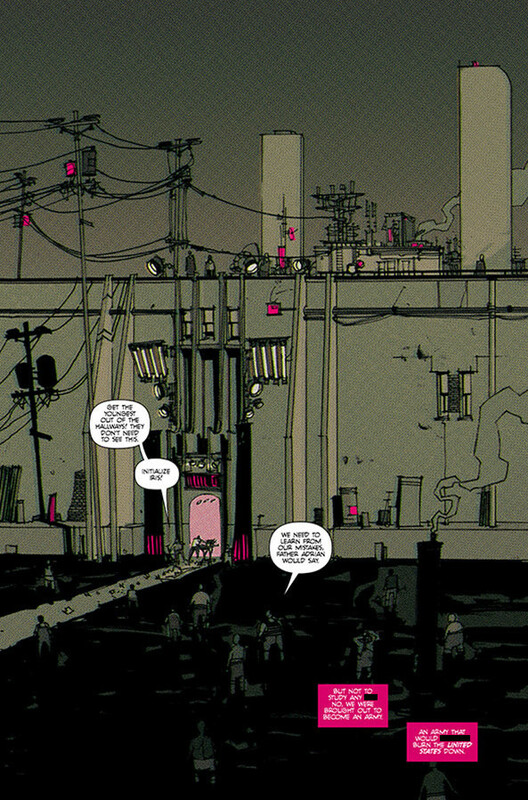 His background at RISD and just his intuitive approach to paneling is really incredible. He creates so much pace just in the way he lays out a page. 6. In the official press release, you mentioned how you became inspired to write a techno-thriller like ‘Thumbs’—watching a young boy grow more and more agitated as he waited for a text response from a friend. We’ve all been there, I think. How will you incorporate that level of anxiety into ‘Thumbs’? SL: Is there anyone right now who isn’t anxious? Everyone I talk to, all walks of life, everyone has this unshakable feeling of ‘what’s going to happen? Who’s saying what about me? Who is thinking this? Who believes that?’ The internet has sped up our lives to a degree that is untenable. We know someone got our text, so we expect immediate response or else they must not like us. We think someone made a mistake so we must destroy them as quickly as possible. We know someone has stated an opinion so we now must form all our beliefs and share them immediately. It’s irrational and we’ve accepted it. We’ve embraced it. I think it’s two things. I think, honestly, most people want to be good people. And they fear, that if they don’t join in these hyper speed conversations at once (even if their own thoughts on it aren’t fully formed) that they will get left behind and evil will win. But what makes humans amazing is our ability to take on emotional information, factual information, historical information and more—and turn that into policy. When you try to do it too fast, before your beliefs have been truly analyzed, then you get zealots and tribalism. You get fascism. Secondly, I think innately we can feel computers taking over and we are trying to keep up with them. We are trying to be as fast as them. The animal side of us, the side that adapts or perishes, is trying to adapt and it is making us like computers: cold and devoid of human compassion. 7. Considering how gigantic tech industries such and Facebook and Amazon are practically running most folks’ lives at this point, ‘Thumbs’ feels almost cynically prescient—Vonnegut taking a crack at something like ‘The Running Man’. Are the technological walls closing in on Sean Lewis? Is there an Alexa in your house that needs ditching? SL: I don’t care about the companies. Companies do what companies do. Amazon wants you to get your products faster, more cheaply and easier. I don’t have a problem with that. Facebook wants you to be able to share pictures with your family and keep tabs on high school friends—and sell a little marketing on the side—great. If people want to use Alexa to help get their coffee started in the morning, do it. I want people to keep being people. That is my concern. Computers are infallible, so now we want an infallible society. Computers don’t have room for context, now we do not either. Computers see human beings as algorithms and avatars, are you telling me you haven’t? I have. I don’t like it. For so many people, life is really hard. It’s hard to hold onto our humanity in the face of cruelty and injustice. It is hard to grow. I believe in things that can make you more human. Tech can do that! It can make your life easier, which allows you to enjoy other things. It’s when it goes from an item we use to better our human experience to something whose experience we start to emulate that I have concern. 8. 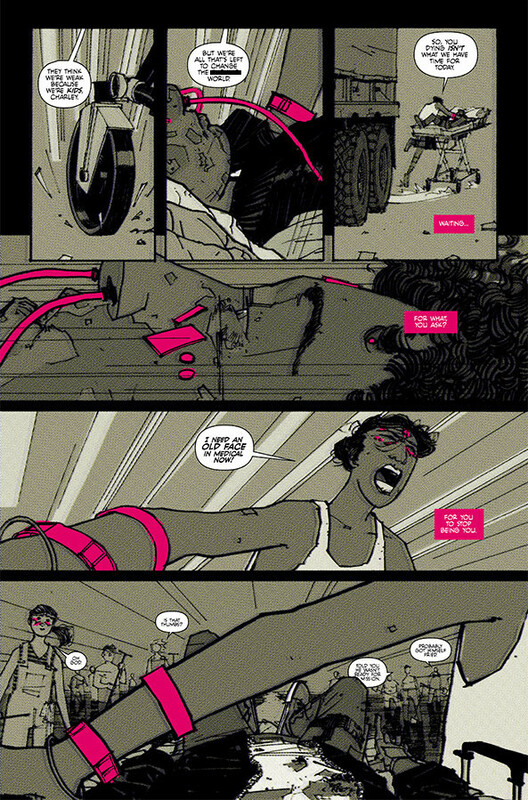 I wanted to talk about the format of ‘Thumbs’: a 5-issue run at 40-pages per issue. We discovered earlier this year that the series ‘Little Bird’, also published by Image Comics, wouldn’t be collected in a trade. Is that what we can expect from ‘Thumbs’? What do you think about independent comics shifting more towards the box set/trade paperback format? What’s to be said about storytelling that doesn’t rely on the regularity of the 22-page floppy? SL: I can’t speak for other books. I know for me I am most interested in how to create an experience for the reader. When we made The Few, I told Hayden that I wanted to slow people down. I wanted to make them read that book like they would a novel. When someone died, I wanted the audience to actually—for a moment—feel loss. And he pulled that off. Thumbs was the same. There is a scope to what Hayden and I are doing that feels more weighty. We are asking you for money. We are asking you to wait 30 days between issues and then pay hard-earned money to read our story. The story needs to be great. The experience needs to be even better. Trades fit our binge culture. I get it all at once and it’s really economical. But when there is a great book that gives an experience, that monthly wait can feel like Christmas. You can get anticipation at getting the next chapter. And—you’ll get the scoop here—Hayden and I are doing heavier pages, more expensive covers (at no extra cost to the readers), and we’re going to do backup stories in each issue. Because that’s what we loved when we read comics. 9. You’re an unabashed Vertigo junkie. What kind of elements from your younger reading years are you bringing to ‘Thumbs’, if any? SL:I’m sure Warren Ellis has informed some of this. I mean, I read Transmetropolitan a lot. I still do. Spider just never stops being relevant. But you’re right, God, I loved Vertigo. I think the audaciousness of Steven T. Seagle’s American Virgin is probably influencing pieces of this as well. 10. Finally, if you would, please describe your ideal soundtrack to ‘Thumbs’. I know you’re a Kathleen Hanna fan. I can already hear a bit of Le Tigre in here. SL: [Laughs]. Yes. I love Kathleen Hanna. Well, I wrote a lot of this to Le Tigre, that is true. As well as: EL-P- “I’ll Sleep When You’re Dead”; Cannibal Ox- “The Cold Vein”; Fugazi- “Waiting Room”; Aphex Twin- “Selected Ambien Works”; [and] Feist- “The Reminder”. 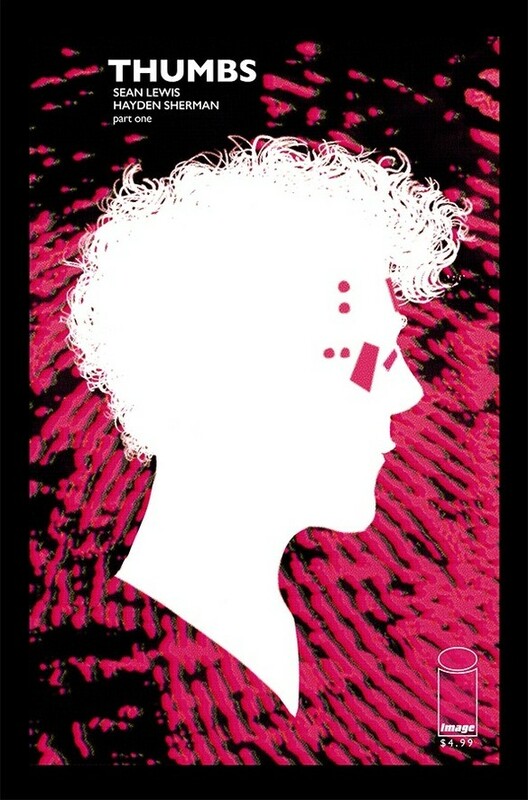 ‘Thumbs’ #1 hits stores June 5. You can pre-order it now (Diamond Code: APR190011). 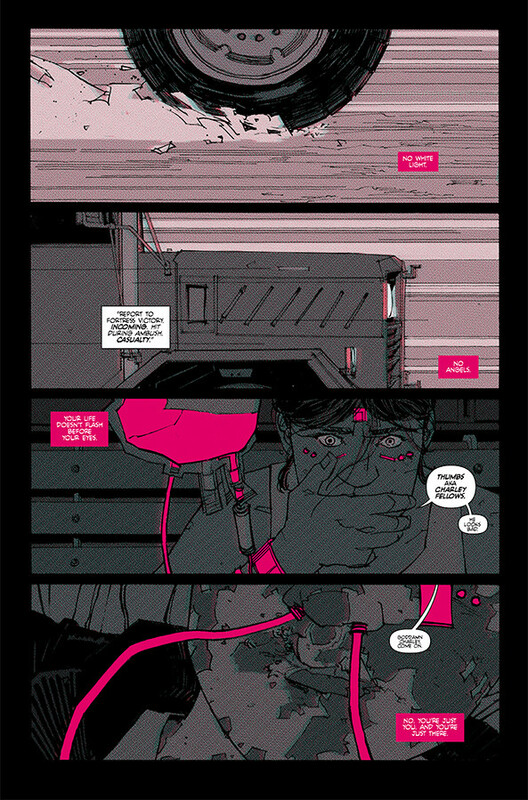 Check out this four-page preview of ‘Thumbs’ #1, courtesy of Image Comics!